Inside the Moonbeams: Why Play with Dolls? Playing with dolls for boys and girls, a classic toy for classic play that never goes out of style. While the dolls may change, the play never does. When the Moonbeams play with their dolls, you can hear the teachers giving words to the child’s action by describing what the child is doing. This is an important step in developing language and literacy. 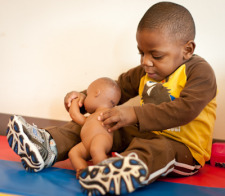 The children go on playing, snuggling, patting, covering and loving the dolls. They do this so they can directly identify with how their parents, grandparents and other caregivers love them. The demonstration of caring and compassion is more than sweet; it is vital for future caring adults. Inside the Super Novas: How do kids make learning fun?